Peace and Joy of Christ to you all. Clare's health has deteriorated immensely. She has a rare kind of skin infection. Her medical reports indicate that it could be some kind of cancer. I asked Mrs Chilube to make arrangements that I meet her during the holidays. 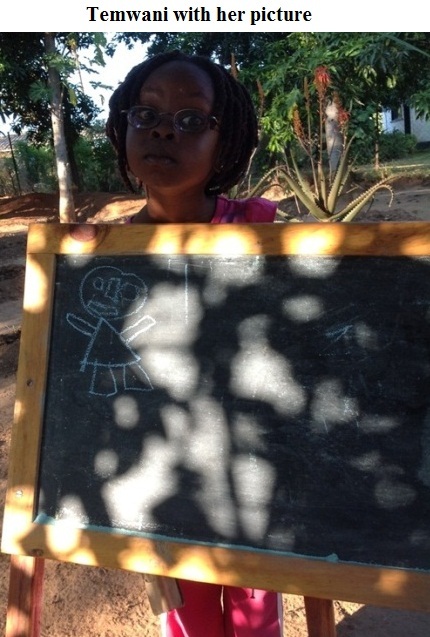 Precious is up and running and completes her secondary school at the end of this year. Well done WINGS. Temwani is in grade one at Happy Day school in Monze. Dear little girl. She is due for her review with the eye specialists in Lusaka in September this year. Her spectacles are scratched, but she continues to use them. She will need a replacement. These ones I saw for myself. Miyanda called me to inform me that he has spotted a lady that he wants to marry near his home North of Lusaka. He asked that I be present for the wedding. He got a job with the council in Mumbwe district, some 300km west of Lusaka. This is a place where the Zambia Airforce has a base. Well done WINGS for giving life to Zambian young people. He tells me that once this is over and he is sufficiently settled he will sponsor himself for more study in Community Development. A new list of children with special needs will be submitted. Ah I almost forgot this great news. 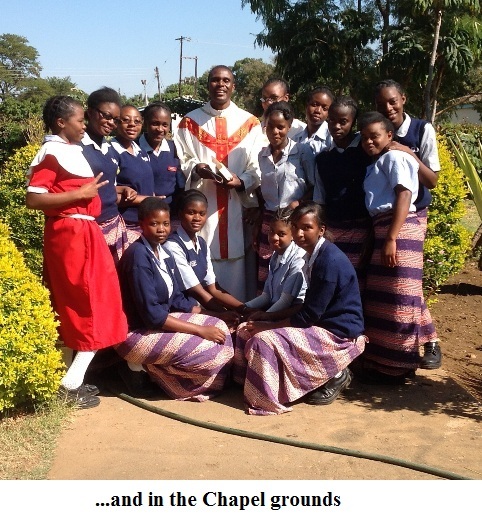 A young girl called Chipo Milandu and now a young lady is doing part-time teaching with us at St. Edmund's. She is one of the beneficiaries of support from WINGS HOLY FAMILY. She is studying journalism together with Faith Chilube at Evelyn Hone College in Lusaka. Such great success. Chipo told our headmaster at St. Edmund's that I took care of her when she lost her mother in Pemba many years ago. We thank the Lord who has guided and provided for these children in the most extraordinary way. I was taken ill on Friday 2nd August 2013 in the morning. My chest was congested. I was labouring to breathe. The doctor in Monze noticed an infection. The weather in Mazabuka over the past four weeks has been horrible. There has been plenty of wind and dust. This has not been good for me and many others with weaker chests. The antibiotics the doctor gave me are very strong and they sedate me terribly. But they are working and I feel a lot better today. I spent the day in-doors to avoid reinfection. The Lord has been very good to me. As I recover, I am also thinking of my return to Luanshya for the final three weeks. I go back on 18th August 2013 and finish on 6th September 2013. I shall be awarded a teaching certificate for both secondary schools and colleges. Teaching full time is not my intention. This study was taken so that I would appreciate well the school environment in which I shall be carrying out the chaplaincy ministry. I hope I shall have recovered sufficiently to undertake those intense three weeks. Once again I ask for the kind financial support of WINGS HOLY FAMILY to complete these three weeks. Schools close on 9th August 2013 and reopens on 9th September 2013. I shall be back in schools for opening ceremonies and masses. My timetable will be light when school reopens as many teachers who were away on study leave return to the schools of St. Edmund's and Mazabuka Girls. I continue to pray for all of you and in a special way for folks that have to carry the cross of ill health. I am with you all in a very special way during the sacrifice of Holy Mass. Mum called me this morning to check on me. She sounded well and in good health. If I feel better I should be going to visit with her on Friday and spend the weekend at home. I must say the past three months have been grilling. I have survived albeit recovering from a chest infection. I am sure by now news has reached you that Fr. Norman Johnston of Blessed Sacrament retires next month. I think he will go up North near his family in Carlisle. He is a good man. He has been my inspiration. I shall end here for now and wish you the best of health and all the blessings you need at this time in your life. We continue to pray for one another. On behalf of Little Hands Pemba love and special waving hands to all at WINGS HOLY FAMILY. Writing this mail felt like speaking to you face to face. Thank you John for your friendship.